If you are wondering just how valued and useful the common sage herb may be, all you need do is understand the name. 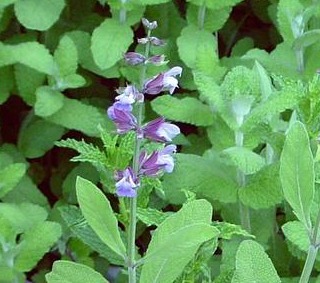 In Latin, it's known as salvia officinalis and all true varieties carry the name salvia. It comes from the Latin root word salvere, which means to save, or to bring good health or to cure. The ancient French called the herb “Tout Bonne”, which means "all is well". So you get the idea that it has long had a place in both the kitchens and in the medicine cabinets of the world. Native to the countries lapped by the Mediterranean Sea, its use dates back to ancient times. It was highly valued in many cultures for its medicinal properties, as is also indicated in the name. The Latin officinalis refers to the name of a monk’s storeroom, the officina, where medicines and herbs were stored. It was used to increase fertility, as a diuretic and as a cure for blood or skin ailments. Its sweet scent was also believed to ward off evil spirits. During particularly dark times, it was a main ingredient in a medicine said to help you avoid catching the plague. Medicinally, its essential oil is a popular remedy for a whole host of illnesses and ailments. More on the oil. If you comb through the ancient texts, this herb has been recommended at one time or another to treat just about every ailment known. Today, modern researchers are finding that it has a lot of promise in the treatment of Alzheimer’s disease, as well as in managing infections and blood sugar levels. It's an evergreen perennial with blue or purple flowers and long silvery grey leaves and is sometimes known as garden sage or just plain sage and can grow from 2-3 feet in both width and height. t prefers partial sunshine but do not plant in full shade. One ancient belief held that the plants thrived or died based on its gardener’s fortunes, so take care not to overwater! Click here for detailed growing tips. Many European cuisines have used it throughout the ages, valuing its savoury flavour. American Thanksgiving would be nowhere without tasty sage in its roast turkey stuffing, and Britain’s Lincolnshire sausages and Derby cheese just wouldn’t be the same. Italian, Greek and Middle Eastern cuisines also rely on common sage for pastas, teas and delicious roasted butternut squash!